Western Blot detection against Immunogen (37.11 KDa). SIRT4 is a member of the sirtuin (silent mating type information regulation 2 homolog) family of proteins which are characterized by a sirtuin core domain and are grouped into 4 class types. Sirtuins share NAD dependency for their enzymatic activity, but some show NAD-dependent deacetylase activity, while others exhibit ADP ribosyltransferase activity or both. Sirtuins may act to influence a wide range of cellular processes such as aging, transcription, apoptosis, inflammation and stress resistance. Seven members make up the family of sirtuins in mammals (SirT1-T7). SIRT4 is a Class II sirtuin. 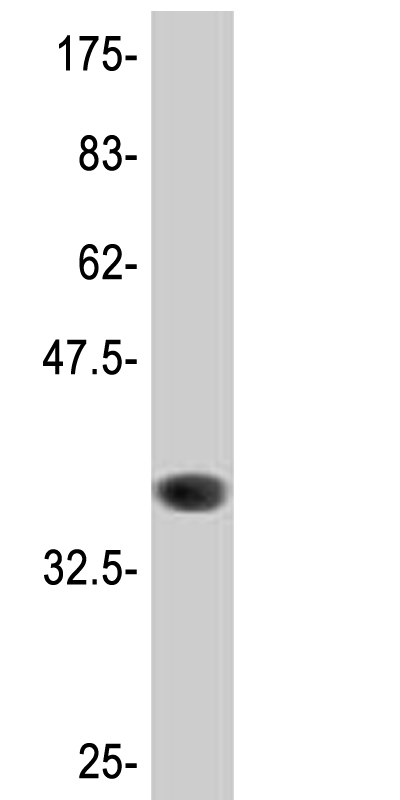 Mouse monoclonal antibody raised against a partial recombinant SIRT4, clone 1C8. SIRT4 (NP_036372, 215 a.a. ~ 315 a.a) partial recombinant protein with GST tag. MW of the GST tag alone is 26 KDa.